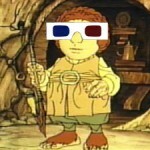 The interwebs have been astir with rumors and sources claiming that “The Hobbit” is being planned as a 3D movie experience. An unscientific but fun poll showed conclusively that almost 75 percent of TORn poll takers didn’t like the idea. Then, the same pot was stirred again with more “sources” backing the original information and a flurry of e-mails landed in our inbox (Spymaster@TheOneRing.net if you have a hot tip!) beating the same drum. Not wanting to disrupt the creative process going on around a pair of films based on “The Hobbit,” we nevertheless asked Guillermo del Toro just what exactly, if anything, was up with 3D Hobbit movies. Since he is the director of the films in question (you know, the guy who picks the director of photography, the cameras and formats and all that movie stuff) we thought he might know. Put that baby to bed and turn off the light.